This weekend’s update to RSVPMaker includes an easier method for setting up a sales or educational webinar, or an online video interview show, using YouTube Live, Google’s free internet broadcast service. 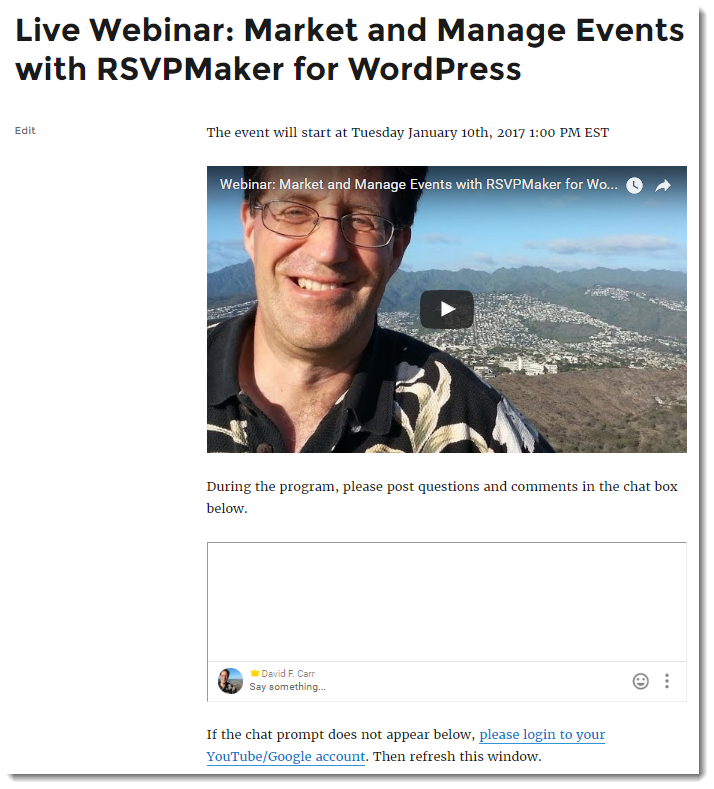 I’m planning my next RSVPMaker webinar for January 10 at 1 pm EST. You can now create a landing page for your event, plus sample confirmation, reminder, and follow up messages in one step, right from within the event editing screen. You can then further customize the reminder message (adding all the reasons why people should be sure to tune in) and the follow up message (at the same time you provide the link to the replay, you can promote a special offer for additional products or services). If your webinar is intended as a way for you to build your email list, or generate sales leads, you can specify that people must register before viewing either the live event or the replay, and the landing page will enforce that requirement. You begin by creating your YouTube Live event. Go to https://www.youtube.com/my_live_events or navigate to that page from the YouTube video manager. YouTube Live settings for an event. If you want to require registration of viewers, you can set your YouTube Live event to “unlisted” so that it will not show up in the directory on youtube.com. You will also create a corresponding RSVPMaker event for the same date and time. Because you may get attendees from other timezones, I recommend you tweak your RSVPMaker date/time display settings to specify that timezones should be displayed on your website. Plug the url for your YouTube Live event into the blank corresponding field under the confirmation message blank and save the post as a draft or publish it. If you want registration for your event to be required, check that checkbox (this can be changed later). YouTube Live field in the event editor. RSVPMaker will create a landing page, as well as a confirmation message that includes the landing page url, a reminder scheduled to go out two hours before your event, and a follow up message scheduled to go out two hours after your event. To help you navigate between these pieces of related content, a message will appear at the top of the page whenever you are editing either the event post or the landing page. You can add or reschedule reminder and follow up messages from the RSVP Reminders screen. The landing page will include the YouTube video feed, plus a live chat stream associated with the event. YouTube Live webinar landing page. Here is that same post seen in the editor, with the YouTube url included on a separate line (WordPress generates the video embed code automatically) and the [ylchat] shortcode that pulls in the YouTube Live video chat stream. (If you don’t want to use YouTube’s chat, alternatives include enabling Facebook Comments on your site). Landing page in the editor. During the live program, you will want to monitor questions / comments from the chat as a way of interacting with the viewing audience. Assuming you stick with the YouTube Live chat, I suggest popping it out into a separate window, which you can do by clicking on the three dots at the right hand side of the chat box. The presenter’s view of a YouTube Live session with the pop-up chat window displayed. During the program, please post questions and comments in the chat box below. If the chat prompt does not appear below, please login to your YouTube/Google account. Then refresh this window. YouTube Live allows anyone to play TV talk show host or broadcast live marketing, tutorial, or entertainment content to the world. I use it to share information about RSVPMaker and related software and to conduct interview programs. 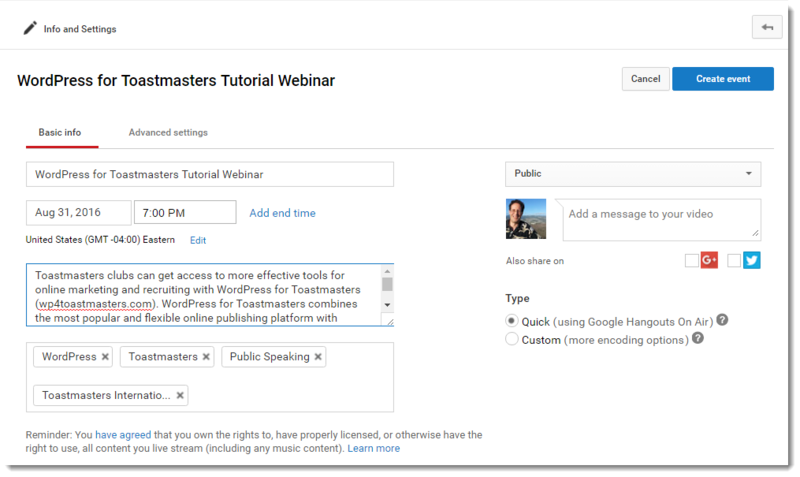 Using RSVPMaker and your WordPress-powered website, you can use YouTube Live as a free webinar platform, registering attendees and directing them to a landing page on your website. After the event, you can gain further mileage out of the event by making a replay available on that same page (YouTube will automatically archive your event for replay). 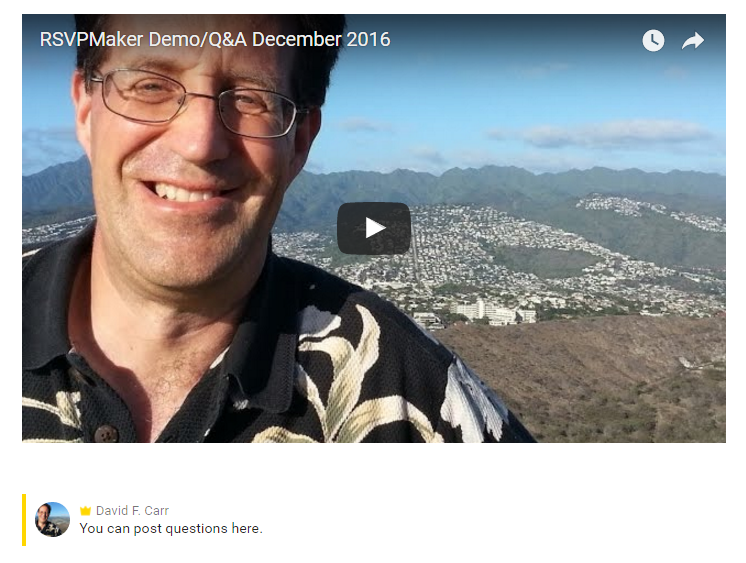 This tutorial follows the exact process I followed to schedule and begin promoting a December 7 webinar on RSVPMaker. YouTube Live is the latest version of what used to be called Google Hangouts on Air, now divorced from the Google+ social network. That change made some of the older tutorial content I’d published obsolete, and this is an update. First, log into your Google account. Go to https://www.youtube.com/my_live_events or navigate to that page from the YouTube video manager. Even before you create the RSVPMaker event, you may want to create the landing page for your site, so the RSVP confirmation can include directions on how to tune in at showtime. Some marketers may prefer to use some specific landing page software, but for my purposes this is a regular WordPress page not included on any menu but not managed with any fancy security either. Rather than making it a top secret, I am encouraging people to register for the sake of getting a calendar invite, plus an email reminder on the day of the event. I’m showing this in Text mode, so you can see the code, whereas the visual editor would include a representation of the YouTube player. For the player, I need only include a YouTube URL on a blank line, and WordPress handles the video player setup automatically. Right below that, you will see an iframe code. That is what allows the YouTube comments feature associated with the video to be displayed on my website. Viewers could also interact with the YouTube Live broadcast on youtube.com, but all things being equal I would rather keep them on my own branded website. Update: you can skim lightly over this next section for background and pick up where I explain the new shortcode for adding the comments field. Here is what it looks like on the website before the show has begun. If you click Play on a YouTube Live video before showtime, what’s displayed is a countdown clock showing the time until the show is scheduled to begin. YouTube Live video player and comments box. A new shortcode, [ylchat] simplifies the process of adding the YouTube Live comment stream. The shortcode function extracts the video ID from the YouTube link included in the page, detects the server domain, and constructs the iframe for the chat window, according to Google’s specifications. The issue is this particular chat stream is only active during the live event, and an error will be displayed in this spot if someone views the page after the event is over. When you set the until attribute, the shortcode function effectively deactivates itself after the time you specify is past. You will be able to post questions during the event using your Google account, or you can tweet them to @davidfcarr before or during the event. I hope you haven’t forgotten you signed up for my webinar tonight! At showtime, you will then launch your YouTube Live program from the Live Events page on youtube.com. You can invite in guests to join you in the live program and screenshare to demo software or show slides. It’s a good idea to get everything organized, including getting your guests signed in, at least 15 minutes prior to the start of the live program. Displaying the YouTube chat in a popup window. When you start the live broadcast you can then switch to that chat window periodically to check for questions coming in. A YouTube Live session with the pop-up chat window displayed. For more about how to conduct a YouTube Live session, see the official help documents. 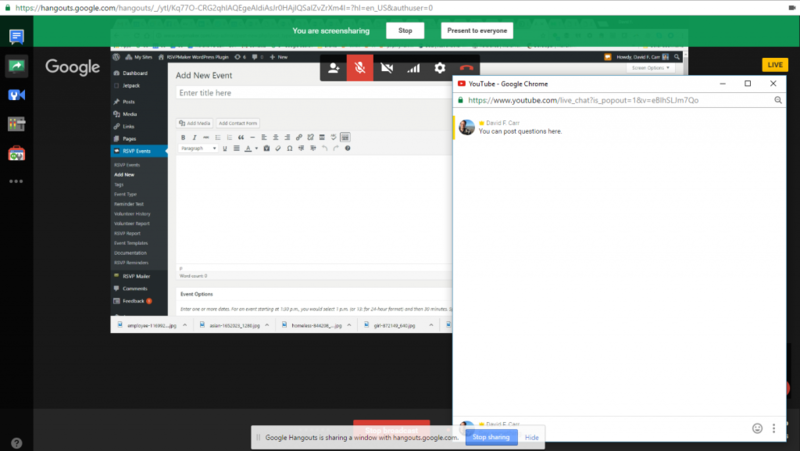 I still like Pat Flynn’s How to Run a Q&A Session Using Google Hangouts on Air as an explanation of how and why to run one of these programs, although some of the content is dated because it refers to the old Google+ incarnation of this service. I also recommend you get familiar with using the YouTube video editor to trim away extraneous content. For example, I often broadcast a “we will get started in just a few minutes” greeting before the program actually starts, but I don’t want that to be something people see when they watch the replay. See Adding, Then Editing Out, a Hangouts on Air Pre-Show Greeting. The separation from Google+ is mostly positive, BTW, since trying to convince people to get an account on that service in order to participate was a losing proposition. However, it meant some features went away such as the Q&A app that was linked to Google+. I found the popup chat window worked just as well for my purposes. I’ve also experimented with embedding the YouTube Live player on a page with Facebook comments enabled, where I thought my audience was more Facebook friendly. If you come up with other approaches, please share your ideas. The latest update to RSVPMaker includes some tweaks for better compatibility with plugins for improved email delivery and particularly the SendGrid plugin, which I may start standardizing on for my own RSVPMaker projects going forward. The plugin improves delivery of basic transactional emails such as password reset messages. RSVP notices to site administrators and confirmation messages to site visitors can come along for the ride. 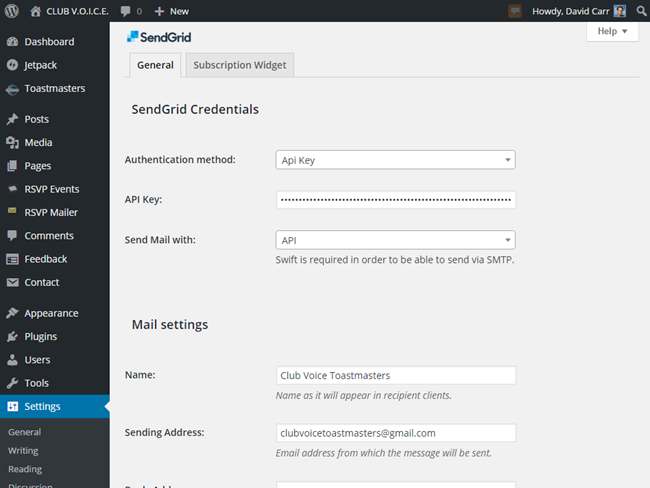 This is API integration with the SendGrid transactional delivery email service, which is different from connecting with SendGrid via SMTP. Instead of setting the SMTP options on the RSVPMaker settings screen, make it “None – use wp_mail()” — the SendGrid plugin will override the default wp_mail() function. The SendGrid mass email delivery service offers accounts that are free for up to 12,000 messages per day. If you have more activity than that connected to your site, hopefully you can afford to to pay for the service. Paid accounts include additional features, but even the free version should give you more reliable delivery of email. After setting up your account, you will create an API key in the settings section of the SendGrid dashboard. The service will generate a long alphanumeric key that you will need to record in the SendGrid settings screen in WordPress. Include a default email from name and sending address to be used for password resets and such. You can ignore most of the rest of the fields for setting a template etc, which are not relevant for the use of this plugin with RSVPMaker. Content-type should be set to text/plain for compatibility with plaintext messages such as password resets (this will not prevent RSVPMaker from sending HTML formatted content). The latest RSVPMaker release should also work better with various plugins that alter the wp_mail() function to make it work with an SMTP server. However, I can’t necessarily test for these. When I tested it in combination with one called Easy WP SMTP, it seemed to override some of the email header settings in the RSVPMaker code so that RSVP notifications came in as “from” the email address set in the plugin, rather than the email address of the attendee. 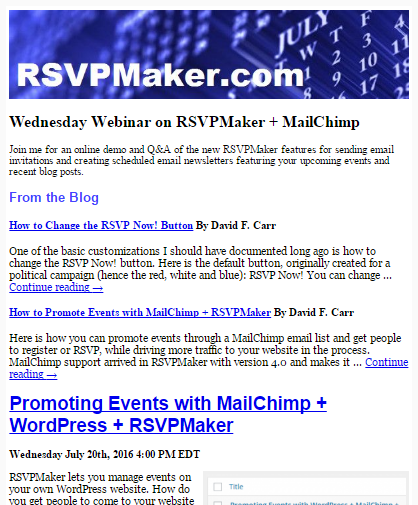 RSVPMaker supports another email delivery service, MailChimp, for mailing list integration, suitable for sending out event invitations or email newsletters. Although there is some overlap between the way SendGrid and MailChimp are used, SendGrid is best known for its capability of sending large numbers of transactional emails like registration or order confirmation messages. One difference is that with SendGrid, we’re not typically broadcasting to a predefined list or relying on the service to manage unsubscribe requests. Like any other email service provider, they will monitor you to make sure you’re using the service responsibly and not spamming people. RSVPMaker only supports sending messages to site administrators, event attendees, and members of your website (with user accounts), so you shouldn’t be using it to email anyone who is not expecting to hear from you. MailChimp actually has a transactional email service of its own called Mandrill, but I haven’t worked with it yet. Mandrill currently offers a free trial, but not a free tier of service. Several people and organizations have been kind enough to produce translations of RSVPMaker into different languages over the years. Unfortunately, some of those are outdated and all of them are incomplete because they do not cover recently added features such as the email broadcast capability. I’m going back to past contributors to see if they will help again, but I am also looking for volunteers. To be clear, this is not translation of content (such as the title and description of an event) but of the menus and explanatory text used within the software. I have made a concerted effort recently to ensure all those strings are properly coded for translation. Now, I just need some bilingual people to help. You don’t need to be a programmer, but you do need to use some specialized tools such as POEdit (shown below) or an equivalent. POEdit displays the original language (English) side-by-side with the translation (in this case, French). The words and phrases in French are the ones for which no translation has yet been supplied. The translation/localization process for plugins is explained in this WordPress.org article. Note that the WordPress.org open source organization is in the process of changing how plugins translation is handled, so that you will be able to do it through a web-based tool. However, they are adding plugins to that project based on their popularity, and RSVPMaker has yet to make the cut. So for the time being, you will need to use a tool such as POEdit and email me the .po and .mo files it generates. In the true spirit of open source, you will be making RSVPMaker more useful for yourself and others at the same time. Thanks! Here is how you can use RSVPMaker’s built-in email utilities to send a weekly newsletter built around your upcoming events and recent blog posts. You can send to a MailChimp mailing list or to the members of your own website (if you provide user accounts). I’ll be hosting a webinar on these techniques Weds. July 20, 2016 at 4 pm EDT. 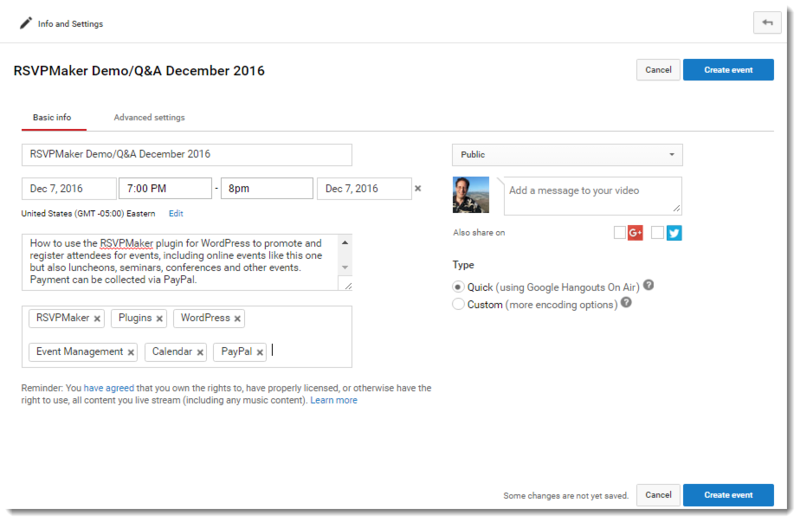 In a separate tutorial, I showed how to create an email broadcast built around an individual event or blog post. Here the idea is to set up a template for a broadcast that will go out on a regular schedule, including some standard elements. 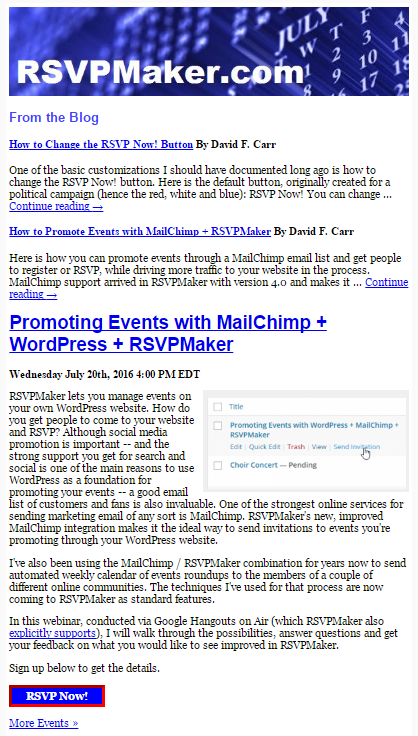 The RSVPMaker events post that serves as the basis for this newsletter consists of a couple of WordPress shortcodes, placeholders for the dynamic content to be included. 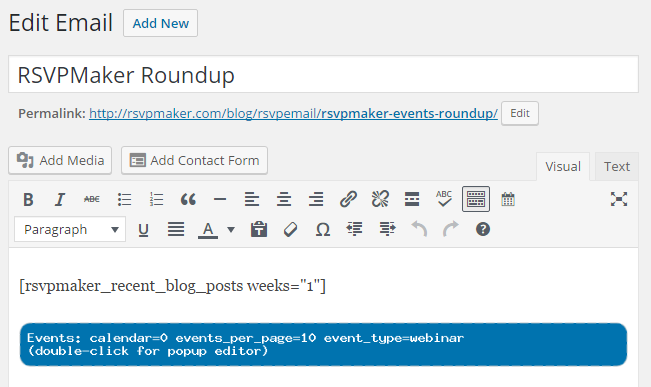 In the WordPress visual editor, the rsvpmaker_upcoming shortcode is represented as rounded blue box that you can click on for a popup menu of options. 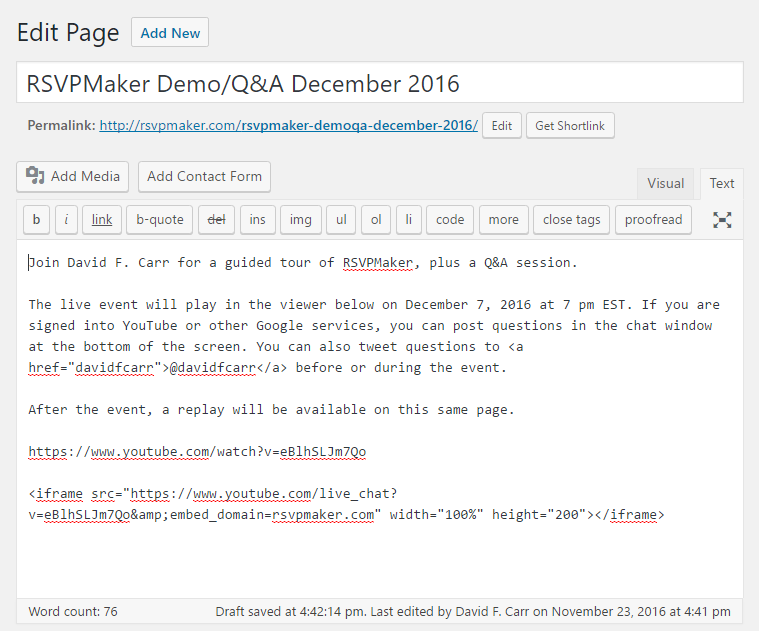 Here, I’ve set it up to pull only the webinar events off the RSVPMaker site (since most of the other events are demos). The other shortcode displays headlines and excerpts from recent blog posts. If I were to preview the email with just those settings, here is what I would see. 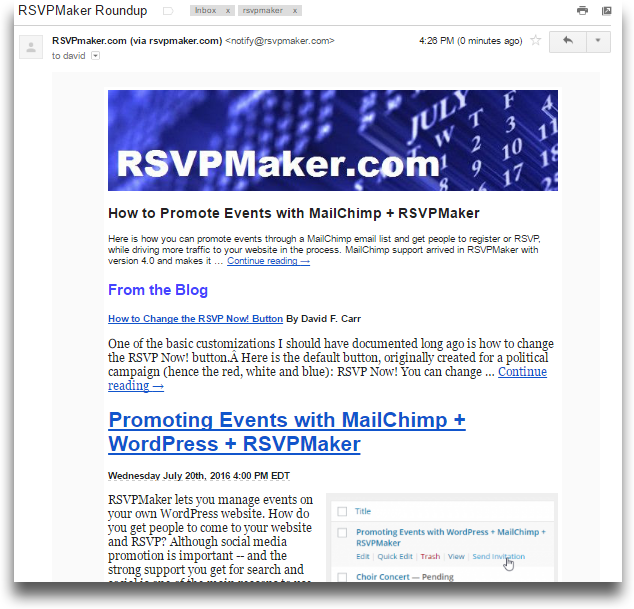 The subject line would be the title of my post, RSVPMaker Roundup. To send this out on a schedule, I need to set the options in the Scheduled Email section. 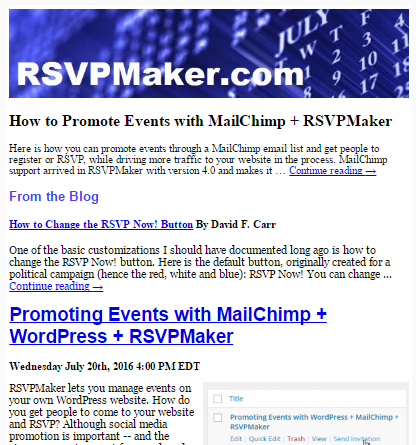 Here I have specified that this newsletter should go out every week to the RSVPMaker email list, on Wednesday at 10 am. Also, I want a preview sent to me 2 hours prior to the scheduled broadcast (a reminder of any last-minute changes I might need to make). The “Test for” option allows me to set a condition, such as that the email newsletter should not be sent if there are no upcoming events on the calendar. This gives me an email newsletter that can go out week after week, always with fresh content. However, I might also want to highlight specific items or add some particular customization to a specific week’s broadcast. The Editor’s Note section allows me to either enter a note or specify a blog post to be featured in the next scheduled email broadcast. This also modifies the subject line, with either the title of the featured post or the headline of the editor’s note appended to the email subject line. The settings shown above would give me an email newsletter that looks like this. This note and headline would only be applied to the one specified week’s email. Here is an example of a newsletter with a featured blog post included up top (note that the featured post is not repeated in the “From the Blog” section generated by the recent posts shortcode. This combination has served me well, and I hope you can also put it to good use.